"On the 12th day of Christmas my true love gave to me...."
This beloved traditional holiday song is the inspiration for our Holiday Giving Blog Series, "12 Days/12 Ways", a promotional effort of goodwill we started in 2010 to draw attention to 12 not-for-profit groups or charitable organizations in Playa del Carmen and along the Riviera Maya. So many people from around the world travel to the Riviera Maya during the holiday season. Many reach out to us via regional message boards and Facebook looking for a way to give back to the less fortunate residents in our local communities. 12 Days/12 Ways was started to help these generous, kind-hearted visitors find legitimate and worthy charitable organizations to support, addressing their particular needs for this holiday season. For each of the 12 days of Christmas, the BuyPlaya Blog, better known as "Life's a Beach", will spotlight a charitable organization or giving opportunity. Some may already be familiar to locals and frequent travelers to this area. Others, perhaps those most in need of recognition and support, may be new to our readers. It is our hope to do this every year, with updated information and wish lists. The "12 Day/12 Ways" list has not yet been completed for 2012. If you have a favorite charity that you feel belongs on this list, collect all of the information you can and I will be happy to consider your group for inclusion. For the past few years, a caring group of Playa del Carmen residents and frequent flyers banded together to help spread a bit of Christmas joy to the less fortunate children of our region. In December 2011 this program, now known as "Christmas Dreams Playa" was able to provide gifts for over 200 children who might otherwise receive no present at all for the holidays. We were proud to not only feature "Christmas Dreams Playa" in our 12 Days/12 Ways blog series but also to contribute personally to this amazing effort of good will! In total over $86,000 mn worth of presents, school supplies and food essentials were distributed by "Christmas Dreams Playa" during the 2011 holiday season, an amazing accomplishment. During the 2011 Christmas Dreams Playa project, one of the participating schools stood out as one that would benefit from and be welcome to sustainable assistance beyond the annual Holiday gift giving. The Pelopides School, an elementary school in the under-served Guadalupana neighborhood on the north side of Playa, was very receptive to the idea of creating a long-term partnership through which an outside group could offer assistance to the school, its students and families throughout the year. The school is run by the La Salle organization of the Catholic Church. While it is a private school, they take in a lot of students that can't afford to go to the public schools. Their tuition is based on family income so they get a lot of students who need assistance. These students usually come to school without the required school supplies and, therefore, can't keep up with their peers. In response to this need, the new KKIS "Keeping Kids in Schools" initiative was created. Their mission: to help keep kids enrolled in school by supplying uniforms, providing school supplies and backpacks, securing English language materials for the classroom and providing volunteers for the classrooms to help students learn English. This particular school was selected because they are one of the few schools to provide financial scholarships their students. At the moment, 50% of their student population is afforded reduced or free tuition, known here as "becas". Some students only require a partial subsidy while others have their tuition covered in full. This school teaches English to all students for half of the day, a skill that is essential for later job placement and advancement. The school administrators are also willing to allow KKIS volunteers into their classrooms to help students learn English by reading to them. This may not seem like an extraordinary request but within the Mexican School system it is very unusual indeed. This school teaches English to all students for half of the day, a skill that is so helpful for later job placement and advancement. KKIS volunteers come into the classrooms once a week to help students learn English by reading to them. As Pelopides School is small and their resources few, much is needed. If you are planning a trip to Playa del Carmen please consider packing some extra school supplies in your luggage. There are 420 children in the school in grades Kinder 1 - Grade 3. Blue ink pens, pencils, erasers, glue sticks, crayons, markers, scissors, rulers, paper etc. are all needed appropriate for ages 3 - 9. Age appropriate backpacks would be much appreciated as they are considerably more expensive here. (Please don't bring notebooks as the schools and the Mexican Board of Education (SEP) require very specific notebooks to be used.) 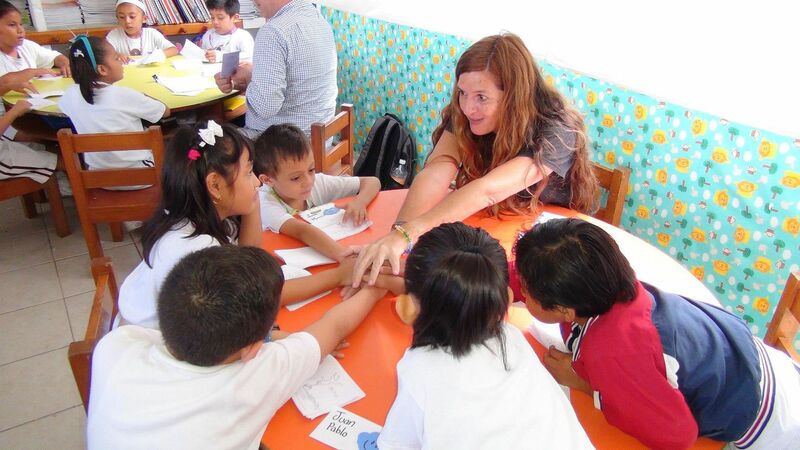 English language materials such as beginning reader storybooks, games, etc are also needed. These items can be dropped off at Wah Wah Beach Bar on the beach between Calle 2 and Juarez, BRIC Hotel on Calle 26 between Avenidas 5 and 10 and Glamour Salon under MEGA Supermarket on Av. 30 and Constituyentes. Of course, monetary donations are always welcome and can be made via Paypal at: KKISProject@gmail.com. For more information, contact KKIS organizer Gayle Collins at the same email address. # KKiS Needs Volunteer Readers! Can You Help?